The mountains show as black monoliths against the moon lit deep blue sky. Snow powder crackles underfoot, reflecting ink blue in the moonlight. Somewhere down the pine clad road a noise in the distance. It rises and falls. A strange sound - like a cross between a long angry dog bark and a spin dryer on full spin. It grows louder then falls away again. "Ah, c'est une 0-3-7" exclaims one of the spectators in excitement. Still kilometres away but unmistakable. This is night time on the Monte Carlo Rally, and we are standing with hundreds of others above the Principality on the Col du Turini. This is one mountain pass and one Rally the Italians take very seriously - and why the Lancia Beta Montecarlo was so called - because of the Stratos and 131 wins on this event. A tradition Lancia and Abarth intend to extend. Around a corner the whining becomes a shriek as the higher frequencies are no longer masked by the trees and snow. The exhaust coughs red on overrun. This is a supercharger on full song - a raw, brutal, guttural rasping - none of the almost polite high pitched melody of a turbo and wastegate. You can literally here the air being cranked into the cylinders by the Volumex blower, and above that is the gear whine of the cogs making it happen. A supercharger is a very different - unique beast and this is one of the best. Suddenly all is light and flashes as the cameras seize the moment. 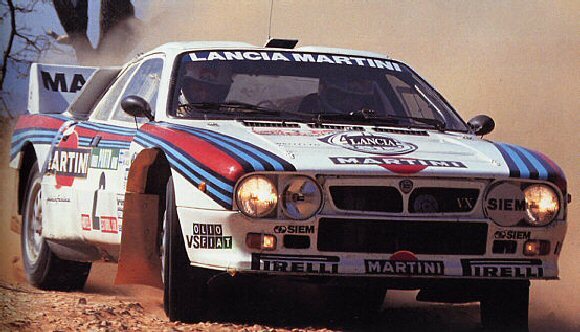 The unmistakable white red and blue of the Martini livery. Then excitement ebbs as the rally car charges more of the night and the mountains beyond. It was clear in late 1980 that a replacement for the mighty 131 Abarth would be needed - even as the 131 was claiming its third world rally crown in four seasons. Rule changes were coming - already sketched out to the constructors - and it was obvious that the ultimate victors would come from the ranks of group B cars. The new Group B regulations - to take affect in the 1982 season - allowed the designers most latitude while constraining the number of cars needed for homologation to 200. The day of the rally prototype had truly dawned. Only five years before the stunning Lancia Stratos had swept away all opposition for a third year in succession. Fiat Group cars had taken all but two of the previous eight WRC championships and most of the main Abarth players responsible for this dominance were still in their positions. What had changed was the opposition. Audi Renault and then Peugeot were to announce their intention to compete. Turbo technology and four wheel drive was to play a part in world rallying for the first time. The Abarth rally designers had several routes to evaluate. A Renault 5 Turbo route would mean putting a smallish capacity, large turbo twin cam in the middle of a Ritmo. Or to develop the newly produced Lancia Delta - soon to have a 1600cc turbo twin cam. What the Group didn't have at this moment was a fully developed 4 wheel drive system for a fast road car. Audi would have this - that much was already apparent. The new engine management systems were not yet available, but electronic injection would be arriving during the development. Two key questions remained. Forced induction would be necessary to compete in power terms, and with a chassis that could supply maximum grip to combat the Quattro's 4 wheel drive advantage. Lancia and Abarth's experience in sports car racing with turbos was considerable. The racing Beta Montecarlo designed two seasons before had been little more than a silhouette. But they had been very successful at getting traction out of corners from these cars, and access for maintenance was good. But the saloon options were rejected. The purpose built rally car option was available within the Group B regulations and was chosen. A Montecarlo passenger compartment with heavily braced front and rear space frames, and a separate mid mounted engine subframe. Now to the question of forced induction - turbo or supercharger? Well the turbo lag problem - delay followed by too much power at the wrong moment was an issue. Also Abarth had been developing the Volumex supercharger over several years. Abarth 131 prototypes (the SE 030 and then 035) had won the Giro d'Italia with one quite recently. Giorgio Pianta - then Abarth's head test driver - had been one of its drivers. The racing Montecarlos had transverse engines, but this was not a good idea for a rally car. Firstly a longitudinally mounted engine would allow the gearbox and clutch to be mounted at the back - easily accessible. Secondly it would allow for a longer wheelbase - and a slower swinging car when going sideways! Thirdly space for the induction and blower side of the engine could be maximised. It might also make for simpler cooling too. The 037 design was completed by the Autumn of 1980. Wheels were 16inch at the front and up to 18inch at the rear. The suspension was changed during early testing in 1981. The initial strut and lower wishbone set up was changed to long upper and lower wishbones. This maximised suspension travel available as well as providing camber adjustment gains - important for gravel rallying. Engine: 4 cylinder, dohc Twin Cam. Abarth supplied the engines - an extension of the 2 litre 16-valve design used on the 131 Abarth, with a larger version of the Volumex supercharger. ECU Weber Marelli, special integral ignition unit. Transaxle and 5 speed box developed by ZF. Suspension: Double wishbone suspension with four rear Bilstein shock absorbers, two at the front. Springs are long, and rising rate allowing maximum travel. Suspension arms are fully rose jointed (protected by foam pads). Steering 2.25 turns lock to lock. Brakes - 4 pot front & rear calipers - supplied by Brembo. Steel space frame front & rear integral with roll cage. Weight: 1040kg Distribution: 42% front 58% rear. The huge Supercharger, marked with a plate type R18/IE, with Abarth prominently cast into the top housing, was the reason. The supercharger maximum boost was set at 0.8 bar. From 1983 water injection was used, direct into the supercharger's plennum and this would have cooled the charge somewhat, but was intended to assist in sealing the supercharger's rotors against the sidewalls of the plennum - improving it's efficiency. In its second and final Evolution the 037 was producing about 350 bhp from 2.1litres of Twin Cam. The last of the two wheel drive World Rally Champions! The cars chassis were made by Marchesi of Modena, following Dallara's assembly of the initial prototype. The first car being ready on Christmas Eve 1980. Almost 12 months later to the day, on the 14th December 1981, Fiat announced the car at its first press conference. 200 Stradale - road going - 037s were homologated on April 1st 1982. The works team was already in Sardinia preparing for its first event. It was not until October 1982 that the car won its first event - in the warm up to the RAC Rally. Marku Alen then finished fourth in the RAC - registering the 037's first WRC finish. There sits the 037 in its Martini livery. Inside the cockpit is small and stark, utterly dedicated to the one purpose - winning rallies. The perspex and plastic door opens easily. I note it doesn't fit the frame too well. Testimony to the more energetic past of the chassis. Inside a flick of the switch and and the relays click into life. None too distantly pumps whirr. One dab of the accelarator and press the red cupped button and the engine fires up straight away. The noises screen all else out - body work and engine sounds are intimate and considerable, even on idle. Blip the throttle and the whine of the supercharger comes from everywhere about. Very pleasant, physical noise. You feel it more than hear it. The car beyond the ample, low windscreen stretches away, larger than expected. On the move the small jiggling of the large rear tyres becomes apparent. It has tarmac tyres on for the test. Of course, for the events and stages, the tyre size and width varied significantly. The car's shod with old Pirelli slicks. Yet the side walls flex impatiently at this slow progress. The gearbox is a five speed - in Ferrari style first is nearest to me on the left rear of the shift pattern. The other four gears spread in a normal H pattern. This is reflected in the chromium shift plate below the gear stick. Straight above first, reverse is guarded by a gate lock to prevent accidental selection. A short stabbing action is required to select gears - this immediately reminds me of all the ZF and Abarth boxes I'd nearly forgotten in the past. Familiarity is assured. The gears are close ratio. Surprisingly close for a forced induction car. But you must remember this car is supercharged not turbocharged. Clutch travel is slightly longer than I anticipate. Torque and acceleration is instantaneous. You work a little to get the most out - jab the gear stick, whip in the clutch and here's 8000 rpm again. Its happening faster than you read this. The 037 will do 100mph in a lot less than 10 seconds. More importantly its as quick getting to 85mph from sliding out of a 20mph hairpin on the loose. Putting it in other way, we can be doing 85mph in way less than 100 yards or 90 odd metres and be braking, ready for the next corner. Punch is the word, the Volumex gives it punch from no revs at all. We are fully warmed up now. I plummet down hill into a traffic cone hairpin, braking physically and deep - I'm nearly standing on the pedal, and the speed falls away without fuss. Time to try a swing turn under the hand brake this time, no pendulum - I'm going straight in with one handbrake application to bring the back around. And this one it doesn't like as much as I paused to let the rear come through before applying power. The hydraulic handbrake 'flew off' in the moment I'd released it, but I'd need to adjust technique to get the best out of the car - and a quick stage time. The spring rates, twin rear shockers and suspension travel are set just right. The 037 is best when driven hard up the box... No trailing throttle niceties or engine braking on down shift - because the chassis is so well balanced. The car behaves as one throughout. Under braking it brakes, when sliding it slides and under acceleration it accelerates. There are no huge transitions to cope with during these stages. It is progressive, gets the job done without nasty habits or front to back/ side to side antics. Predictable, with the power to pull you out of slides at will. This is why it could take on the four wheel drive competition. This driving technique is different to today's front wheel or 4 wheel machines. The car expects you to set the tail out and power around the corner. It doesn't understand if you lift in the corner - it will just go straight on. This is not understeer it's far too dramatic to be called that. It is 'straight steer' as turning the steering will have zero effect and the 2.25 turn quick lock will not save you - even on tarmac. So you don't lift and you do keep that lovely power on. Complaints from the car come in the form of wheelspin. Despite the lsd it does 'do' wheelspin well. But all happens in a very nicely sequenced 'conversation'. Listen and the car tells you what its going to do next, so you can be there with it, as it expects you to be. Of course this happens because of all those near infinite weeks of test sessions and the small changes to all those prototypes down the rally seasons. But it is confidence inspiring - within minutes I'm at home in this machine. It is so easy to feel the balance and drive centres under power when going side ways. On the limit on the wide test track corners then you can just detect the compromises of the setup. It is not quite as quick through the corner as a full on racer - but that's not what the 037 was about. It drives as good as it looks. Last of the two wheel rally champs. Summit of all the knowledge of its designers. If you love driving and Twinks this is the ultimate one for you.